Volunteer vacations solo travelers, Factoring a volunteer vacation into a stint of independent travel is a brilliant way to break up long spells on your own, meet people with similar interests who could become friends for life and make a difference to the lives of children, women, and animals in impoverished parts of the world. 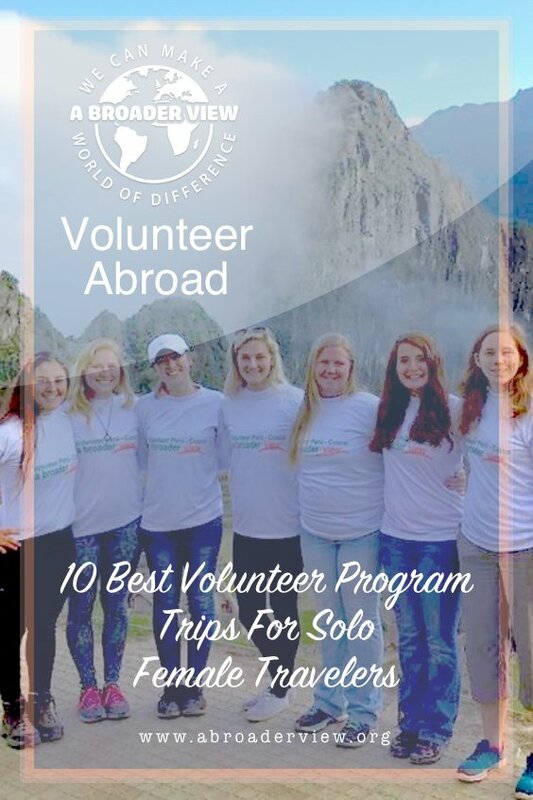 Volunteer vacations solo travelers. Going wherever the wind takes you. Doing whatever you feel like. Spending some quality time with yourself. Traveling alone is one of life’s great experiences, and one of the best ways to really get to know yourself and what you’re capable of. While solo travel has many perks, there are a couple of downsides too. Loneliness is one – after spending so much time with yourself, sometimes you start to crave company and human interaction! That’s why we have host families and local coordinators that can help you find activities for your free time, gym, tours, point out locations to visit, and local gathering for tourists. Safety concerns may also affect lone travelers more than their peers who are traveling as a couple or with friends. As a solo traveler, you may feel uncomfortable visiting certain destinations on your own. The great news is that if either of these concerns surfaces before or during your travels, we have a solution that lets you travel alone in a safe environment, make friends with like-minded people AND give back to disadvantaged communities. Factoring a volunteer vacation into a stint of independent travel is a brilliant way to break up long spells on your own, meet people with similar interests who could become friends for life and make a difference to the lives of children, women, and animals in impoverished parts of the world. Why should solo travelers volunteer abroad with A Broader View? In the eleven years, we’ve been up and running, we are proud to have maintained a 100% safety record. We’ve worked hard to foster and maintain excellent relationships with our trusted partners, so you can relax knowing your safety and wellbeing is taken care of. One of the joys of international volunteering is sharing your experience with like-minded people. Our volunteer work abroad programs attract people of all ages from all over the world, so there will be ample opportunity to make friends! You’ll be staying in shared accommodation, or with a host family, so you’ll be surrounded by all sorts of interesting people. And the best thing? No single supplement! We welcome all travelers and strongly believe solo travelers shouldn’t be penalized by having to pay extra. Volunteering takes place during the week, giving you the chance to enjoy your weekends by yourself or with your newfound friends. 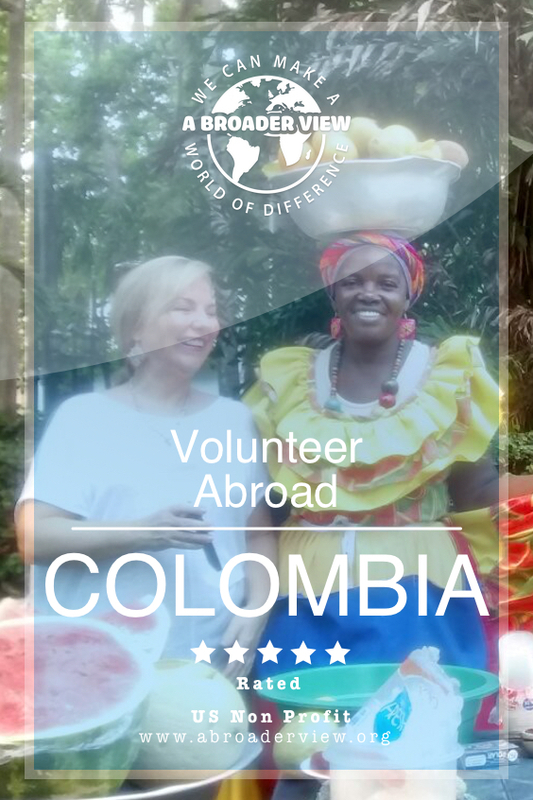 So whether you’re on a six month round the world trip or planning a two-week vacation, enrich your travels with volunteer vacations for adults, students, and seniors! If you’re a solo traveler India is a popular place to find yourself and a deeper meaning to life! It’s also a great country to push your boundaries and immerse yourself in a new and colorful culture. With our fantastic range of programs, you can effectuate a positive social change while focusing on personal growth. 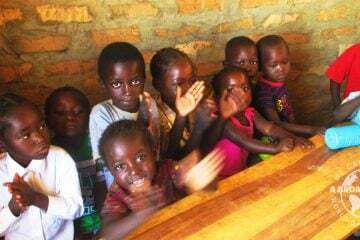 Enrich young lives, why not teach English, help at an orphanage or provide assistance at a special needs center? Tackle gender inequality by volunteering with women to develop their independence. Or if you want to do something completely different, how about volunteering in an elephant sanctuary? With our array of inspired community programs designed to provide help where it’s needed the most, Uganda offers purposeful, challenging and fun volunteer vacations for singles. From raising awareness about solar health initiatives to medical, maternity and childcare programs, there are plenty of opportunities to make a real difference here. A safe, stable West African nation famous for its friendly natives, volunteer Ghana is a great choice for solo travelers. With bazaars, rainforest, wetlands, lakes and tropical wildlife, it’s a land ripe for exploring before or after your volunteer vacation. When you’re not busy diving into the culture or marveling at the unique ecosystems, you’ll be getting involved with teaching missions or (pre) medical student programs, or providing assistance in schools and orphanages. Trekking, mountain biking, river rafting. National parks, jungle safaris, ancient temples. There’s plenty to keep a solo traveler busy in Nepal! We’ve also got lots of volunteer programs on offer with something to suit everyone. From teaching English to monks and volunteering in an HIV/AIDs children’s center, we not only offer the best solo vacations for lone travelers but also the most varied! You can even split your time in Nepal between volunteering and learning the language with our Nepali language immersion program. Bear in mind that this is compulsory for those volunteering in the school, orphanage, monastery, and hospital. Our sea turtle and sloth conservation projects are some of our most popular across the board. Join us on one of these amazing wildlife projects or volunteer in a Sloth Sanctuary, museum, elderly care center or on a pre-medical program. You can also combine some programs with Spanish classes if you’re keen to pick up some of the languages while you’re there. With sun, sea, sand and the chance to make a difference in this beautiful part of the world, your trip to Costa Rica with A Broader View is guaranteed to be one of the best solo beach vacations of your life! Mayan culture and traditions are still very much alive in stunning Guatemala, which is home to rainforest, beaches, and volcanoes. Learn Spanish from a native on our language immersion program and spend your volunteering hours in public health centers, daycare centers, animal rescue centers and more! 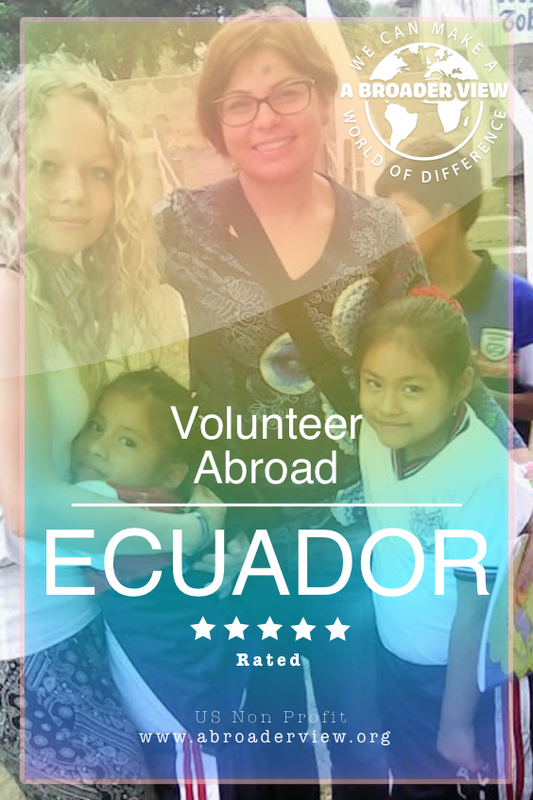 If you want to do something totally unique, volunteer abroad in Ecuador is the place to do it! This friendly and beautiful South American country hosts some of our more unusual programs, including hippotherapy, volunteering with street kids and cultivating traditional crops in an aboriginal community. Our Amazon community development program isn’t for the faint-hearted – you will need to be physically and mentally prepared for rustic living conditions and hot, wet weather. You will also need to be able to converse with locals in Spanish. One of the best places to travel alone, Volunteering in Chile is safe and truly stunning with its striking natural wonders and rich cultural history. Dedicate your time to volunteering in a school, orphanage or elderly day care center, or split your time between our Spanish immersion scheme and our selection of volunteer abroad programs. Are you packing your bags yet? Here at A Broader View, we believe the best life lessons come from hands-on work and experience, so we aim to make our solo vacation packages as affordable as possible. As a registered charitable non-profit organization, US taxpayers’ program fees and related travel expenses are tax deductible, making for relatively inexpensive volunteer vacations. If you’re not a US citizen, don’t worry – find out how fundraising can cover the cost of your trip. If you’re a solo traveler blog research is invaluable when deciding where to go and searching for hints and tips to keep you busy, safe and having fun! 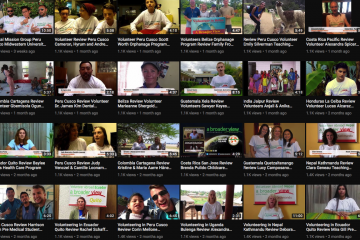 Take a look at our jam-packed blog for inspiration – from grassroots environmental projects in Uganda to radio journalism in Argentina, we are proud to offer the best volunteer abroad programs! So don’t think twice about solo travel – instead, think A Broader View!